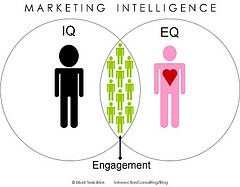 Emotional Intelligence: do you need bucket loads of it? I’m focusing this time on the concept of emotional intelligence (EI). Is it mumbo jumbo or a secret weapon you can tap into? Read on to find out! EI – what is it? How can EI help you? Emotional intelligence: What is it? How can it help you? His definition says that “EI is about being smart, how we handle ourselves and our relationships”. Essentially he talks about how this matters more than IQ and educational success. How about we bring EI alive? Let’s think about this together. Imagine a very bright person, very intelligent, who has passed lots of exams. Now add in their interpersonal skills, how they get on with other people…say in this case poorly. In Goleman’s terms they are best suited to back room jobs where they can be great thinkers and analysts. However, most jobs require some people contact and relationship building. So imagine the combination of someone who is bright and good at relationships…they will find it much easier to find work, will be good in a team, able to lead a team etc. All round they are more likely to be successful in the organisation as they don’t need to work in isolation! Goleman says the EI competencies (which we will come onto in more depth) are not innate talents, but learned abilities. So how does this apply to all of us? To be more successful we can all work on our EI; to get the best out of ourselves and others, to adapt to situations we are in and the people we are with.